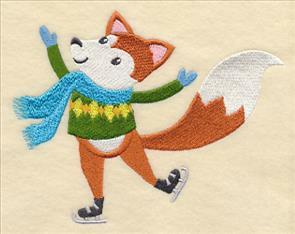 Warm up to winter with frosty and fabulous embroidery designs! The temperatures may be dropping, but creative ideas and inspiration are on the rise. 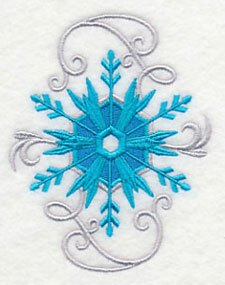 These new designs celebrate winter's beautiful icy palette with a variety of subjects and styles. 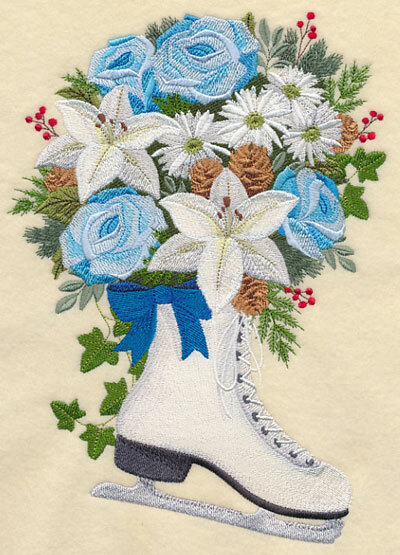 Flowers in cool shades of blue bloom from an ice skates. Dogs are wrapped up in winter with colorful scarves; birds perch on snow-covered branches. 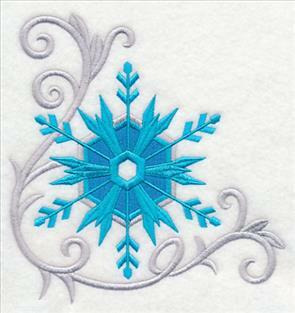 And, gorgeous snowflakes are framed in elegant filigree, bringing a glorious look to pillows and table linens. 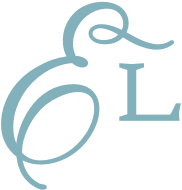 Scroll down the page to see the variety in these new designs! Free tutorial! Cozy fleece scarf with freestanding lace snowflake and loop! a beautiful focal point on tote bags and pillow covers. 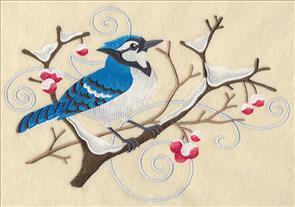 Stitch on a wall hanging to welcome winter in a lovely way. 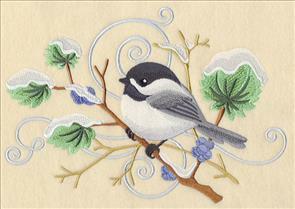 6.89" x 9.59" and 5.59" x 7.79" and 4.86" x 6.76"
Blue jays and chickadees perch on frosty branches, bright with berries. Elegant swirls and whirls of filigree loop in the background. 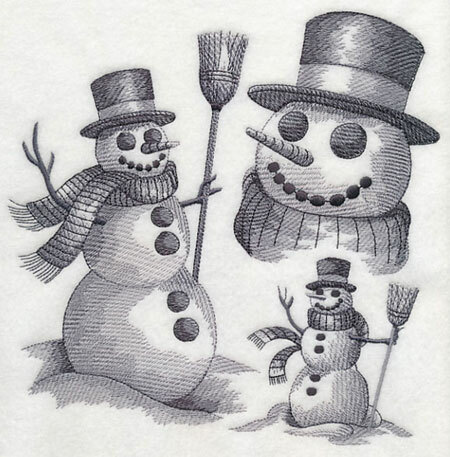 These designs are lovely on sweatshirts and place mats. 10.02" x 6.90" and 8.51" x 5.86"
9.67" x 6.91" and 7.81" x 5.58" and 6.82" x 4.87"
A bright-eyed owl perches on a frosty branch, while a squirrel is busy gathering autumn's last acorns. 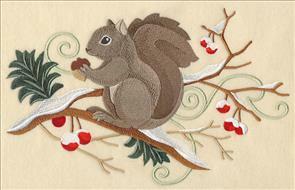 Bring a natural winter look to bolster pillows, wall hangings, and mini-quilts, with these designs. 11.42" x 6.89" and 9.39" x 5.66"
10.91" x 6.86" and 9.32" x 5.86"
7.79" x 4.90" and 6.86" x 4.32"
The above designs are horizontal compositions; the subjects are available in vertical arrangements, too! 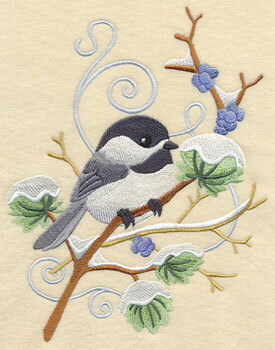 The sweet chickadee and bright blue jay are below, perching on snow-covered branches with colorful berries. 6.90" x 9.09" and 5.90" x 7.79" and 4.90" x 6.48"
The bright-eyed owl and busy squirrel are available in vertical compositions, too. A perfect fit for pillows covers, place mats, and the backs of denim jackets. 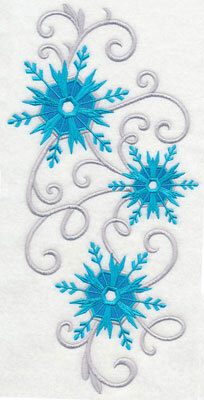 6.86" x 9.20" and 5.81" x 7.79" and 4.90" x 6.67"
Dramatic snowflakes in wintry blues are framed in graceful filigree. The hues of blue and silver contrast beautifully! The square design is a lovely shape for pillows, tote bags, and place mats. 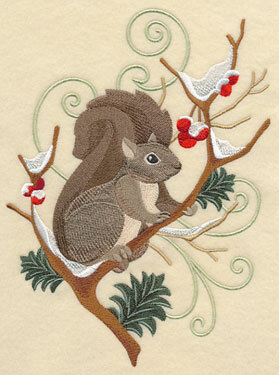 The spray is a dramatic addition to quilts and wall hangings. Or, rotate 90 degrees and add to the bottom of tea towels, bolster pillows, and table runners. 7.74" x 7.81" and 6.85" x 6.92"
5.85" x 5.91" and 4.85" x 4.89"
5.70" x 11.75" and 4.57" x 9.41"
3.79" x 7.81" and 3.33" x 6.85"
This border design features a stately snowflake in the center, and symmetrical filigree on either side. 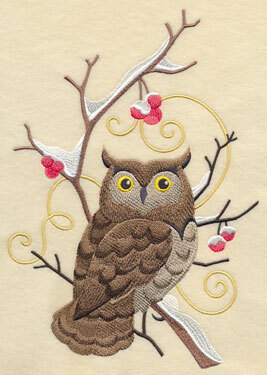 Beautiful on tea towels, borders of quilts, and shirt fronts! And, especially nice on fleece blankets and the yokes of vests. 11.75" x 4.50" and 9.41" x 3.60" and 7.81" x 2.99" and 6.00" x 2.56"
Stitch corner designs and small snowflakes onto linen napkins and pockets. Add to fleece blankets and pullovers, too! Bring winter's beauty to your home with these designs! You can order the designs singly by using the links above, or buy the whole blizzard in a design pack! 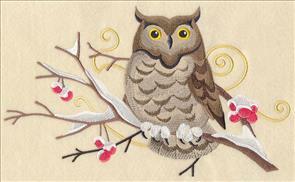 Add color and character to fleece blankets, pillows, and wall hangings, with these designs. 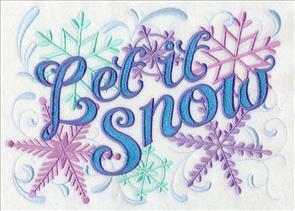 The words 'Let it Snow' are imposed against a flurry of colorful snowflakes. 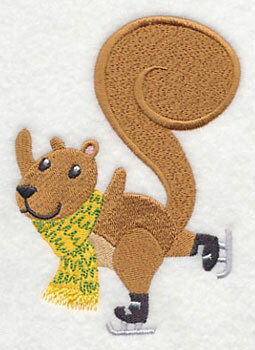 The design on the right is a delightful addition to scarves, the backs of fleece vests, blankets, and pillows. 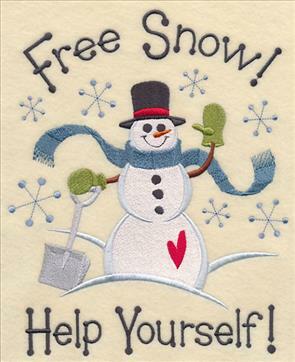 9.71" x 6.90" and 7.80" x 5.55"
6.91" x 6.86" and 7.81" x 7.75"
These snowman are filled with personality and charm! 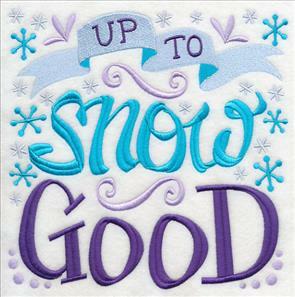 Add frosty fun and smiles to mini-quilts, pillow covers, and winter totes. 6.88" x 8.47" and 5.85" x 7.21"
6.85" x 8.42" and 5.85" x 7.19" and 4.85" x 5.96"
It's become a tradition at Embroidery Library to draw and digitize dogs in designer scarves at the beginning of each winter season. We're pleased as can be to present six new breeds! You can see the previously-presented designs by clicking here, or using the keywords wrapped up in winter in the search box. 11.00" x 4.53" and 9.40" x 3.87"
11.00" x 4.75" and 9.41" x 4.07"
7.81" x 3.38" and 6.87" x 2.97"
The horizontal composition of the designs make them a nice fit for the fronts of sweatshirts, the backs of fleece vests, and bath towels, too. 11.00" x 4.75" and 9.41" x 4.06"
11.00" x 4.66" and 9.41" x 3.99"
7.80" x 3.31" and 6.87" x 2.91"
The long scarves trail behind the dogs as if they were blowing in a winter breeze. Change the color of the scarves to match your garments and home decor! 11.00" x 4.58" and 9.41" x 3.92"
11.00" x 4.62" and 9.41" x 3.95"
7.80" x 3.28" and 6.85" x 2.88"
Winter's arrival means that it's time to dust off the ice skates! 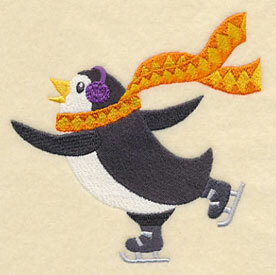 These animals leap and glide on their skates, enjoying their cold-weather sport. They'll bring color and energy to fleece scarves, jackets, and quilts. 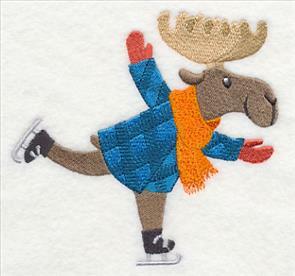 5.98" x 4.83" and 3.85" x 3.12"
A moose and penguin are graceful on their ice skates. 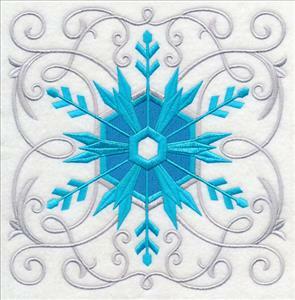 Stitch these designs onto winter-themed bath towels, sweaters, and pillows. 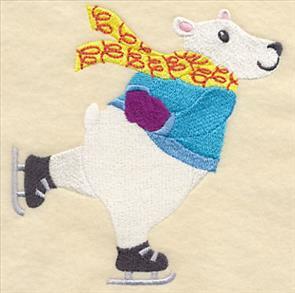 4.86" x 4.83" and 3.85" x 3.83"
A polar bear and squirrel are dressed for winter in colorful scarves as they zoom around on their ice skates. 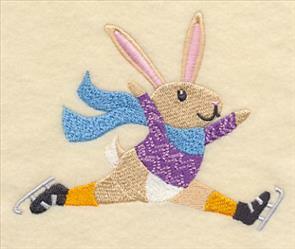 Stitch onto the ends of fleece scarves, winter-themed tote bags, and cushion covers. 3.59" x 5.04" and 2.75" x 3.86"
Bring these frolicking winter-lovers to your projects today! Order the designs singly by using the links above, or get the whole team of six in a design pack! 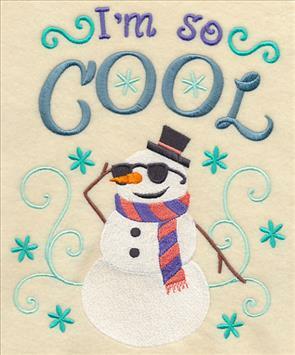 Lisa knew that a friendly snowman in a sketch-style would be a frosty and fun addition to winter decor! Sketch-style designs are light and open, and they're an excellent match for smooth, neutral fabrics. 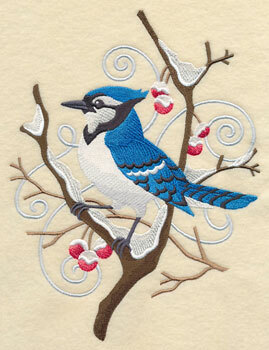 Embroider onto tea towels, twill, quilter's cotton, duck cloth, and similar smooth fabrics. Steer clear of patterned fabric, as the sketch effect will be muted. Thank you, Lisa, for the excellent suggestion! 7.80" x 7.78" and 6.90" x 6.89" and 5.87" x 5.86" and 4.87" x 4.85"